A recent article based on the remodeling and design platform, Houzz, forecast some trends to look for in the coming year. With HGTV shows continuing to capture our imaginations and wallets, we might want to know that we are in step with the design world. Full-height backsplashes extending all the way to the ceiling behind open shelving and range hoods is one of the newer concepts being adopted in kitchen design. Although Living Coral was chosen to be Pantone’s color of the year, the experts see moodier colors, like navy and forest green, as the shade of choice for homeowners. People are becoming more comfortable experimenting with rich or darker colors. Open spa-like bathrooms are making up 80% of the remodels according to Houzz. Soaking tubs was the most popular option even if it meant stealing space from the closet or bedroom. 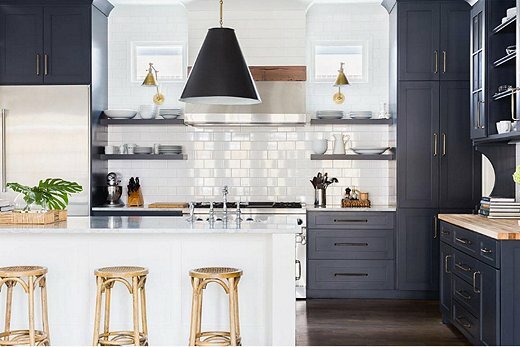 Moving from white to black kitchens is another popular choice for 2019. White kitchens have made it difficult to keep clean if you have children and/or dogs, so remodelers are opting for the “tuxedo” kitchen with contrasting black cabinets and white walls. Free-standing padded dining benches have replaced the built-in, more expensive benches of the past. These new benches can provide flexible seating and hidden storage. A four-wall accent color is replacing the bold-colored feature wall. It even includes the trim and molding. This trend seems to be happening in smaller rooms, like a bedroom, study or media room. These six examples of home remodeling choices are some of the possible options you may want to experiment with in the new year. If you need funds to finance your DIY efforts, and if you do not qualify for a conventional loan, Sun Pacific Mortgage is here with a Hard Money loan to support your artistic endeavors.